Comedian Stephen Colbert and Cardinal Timothy Dolan matched wits on faith and humour on Friday at Fordham University. 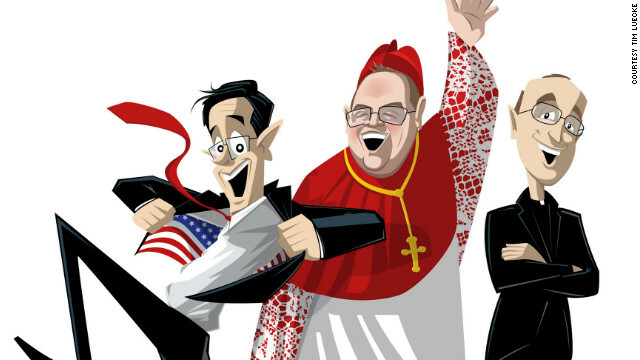 (CNN)– What do you get when you mix the highest profile American Catholic bishop, an icon of American comedy, a priest who regularly writes about comedy and a media blackout? The answer: a unique look at the cross-sections of faith, humor and joy. Cardinal Timothy M. Dolan, the highest ranking Catholic in the United States, and comedian Stephen Colbert, the host of the popular late night comedy show “The Colbert Report,” put their views of faith and humor on display for a private audience of 3,000 at Fordham University on Friday night. The event was closed to the press, save a few invited journalists who came as guests. But despite the embargo, some attendees shared the play-by-play over social media, turning what was supposed to a private event into a free-for-all. A number of reporters in attendance also wrote about the conversation on faith, some suggesting that any embargo on the information had been shattered by social media. “Here’s my reason for joy: the cross,” Dolan said, who went on to argue that the reason for happiness is the fact that even after Jesus was crucified, he rose three days later. The event, moderated by the Rev. James Martin, took place in front of 3,000 cheering students in Fordham’s gymnasium. Colbert is the youngest child in a family of 11 kids and was raised by Catholic parents. The comedian is also raising his child Catholic and he even teaches Sunday school in New Jersey. Dolan, while also being a cardinal in the Catholic church, is the president of the United States Conference of Catholic Bishops, the church’s U.S. arm. Due to the desired media blackout, much of what is known about the event came from Twitter via Grant Gallicho – the associated editor of Commonweal, a lay Catholic journal, and others using the hashtag #Dolbert and #DolanColbert. According to a New York Time story, Dolan gave a “meandering” answer to the question. A Public Religion Research Institute poll earlier this year found that almost 60% of Catholics supported allowing gay and lesbian couples to legally marry, despite church teaching to the contrary. One of the best received jokes of the night was in response to a question about joining the priesthood and it’s requirement of celibacy. Dolan encouraged men thinking about the priesthood to date. Colbert chimed in and quipped it would be a great chance to use the pick up line, "I'm considering the priesthood, but maybe you can change my mind,” Gallicho tweeted. Another zinger came in exchange between the cardinal and the comedian. Dolan asked, "Do you feel pressure to be funny all the time?" Colbert fired back: "Do you feel pressure to be holy all the time?” according to a news release by Fordham. The event was the idea of Michael Peppard and Charles Camosy, two Fordham professors who came to Martin with the idea. They wanted to tie it to his recent book, “Between Heaven and Mirth." In Martin’s opening remarks, he touched upon the way that Dolan and Colbert use humor. “They are my favorite humorist and Catholic leader, though, from time to time, I’m not sure who is who,” Martin said. CNN had been in negotiations with event organizers, with the hopes of live streaming the event and broadcasting a taped special after the event. Negotiations broke off abruptly when the organizers decided to close the event to the media. We are all Pangeans. Pangea was the the first continent created on this earth. Than the devil broke Pangea into many continents. The creator was saddened. His angel gabriel saw God's sadness asked if there were people on these continents who looked like him and not the devil would that please him. God said let there be life. Humanity spread over all the continents. The devil saw this and said "let them speak in different tongues' so they will always live separate. God then gave his creation intelligence but the devil gave them faith to believe in him. Today on earth everybody forgot that God is just a creator and does not need to be worshiped. When holy men pray today they do not understand that their prayers are diabolical. God knows when we grow up we really do not need myths of for that matter the creator. A good parent never creates a dependent child. So what magic pills do I need to take to be able to see the look on God's face like you witnessed? Also I think there are a few other theories as to why the Continent broke up. You may want to actually read up on the existing theories before just making up an alternative. You thought this up all by yourself. That should be your first clue that it is BS. You have created a god in an human mind which can be no god at all because he is subordianate to your human thoughts. God is depicted as a man in most faiths. Throughout history women were depicted as less worthy than men. Today men finally understand that women may be more worthy than they are to deal with life. Faith based books contrary to Mr. Colbert and Cardinal Dolan are not worth the paper they are written on. How sad that at the beginning of the 21st century there exists a need to provide a forum for this to be spouted. Actually the earliest known story of genesis from Sumeria (from clay tablets), describes a woman named Jeha (female warrior) who creates the earth in 7 days, finally after separating the seas and heavens, creating land, and then studs upon the shore so she can populate the earth with more of herself. It evolved over time to Jehova (a male persona – literally 'great warrior') and with other variations, but for some reason everybody liked 7 days. I guess everybody wants a day off. Dolan sounds like a typical lost man down at a Boston bar. Unlike Peter and Paul who were all about salvation. It's really best for all people including children to have an agnostic approach to god, and an atheistic approach to all religion. It keeps things simple for kids, and lets them be all that they can be. They just need to be taught that some things, like all religion, were just made up by salesmen and politicians from long ago. (Yes, charlatan folklore and spam started long before the Bible; what would make you think they hadn't?) And they need to be taught that other things, like God, we really don't know a damn thing about. Atheists have strong minds and don't need a religion. Many religious folk have the best intentions. But too often, religious folk run and hide their misdeeds within their religion (and by doing so, they disserve society). And too often, religious folk are easily offended when someone mocks their make-believe characters – and, as we can see they can get really CRAZY! Although there are many religious folk with good intentions – some selflessly helping others, religions and religious organizations are, as a whole, just big old clubs – each trying to out do each other and inspiring hate and division (often disguised as love) along the way. The problem is that people too easily buy into religion and don't realize how unfounded it all is. And when they buy into it, they buy into a lot of really old, really weird tenets that are nothing but harmful for the human species. Take Christianity, for instance. Just look at all the things that Christians argue about amongst themselves today – abortion, men's and women's roles in the church, celibacy, contraception, acceptance of gays, etc. Most of these issues have their roots in the conflicted, unfounded tenets of early Christianity. Non-Mormons harp on Joseph Smith these days. But we really don't have any more proof at all to believe that Paul, the self-proclaimed "apostle" was anything more than an ordinary man who needed to make up religious "sales literature" to survive and spread his own personal beliefs. And yet a good chunk of the NT is attributed to Paul and accepted by many Christians. And a lot of what he wrote about has to do with many of the issues I mentioned above that have Christians fighting amongst themselves hundreds of years later. It's way too unfounded to argue over. Get a good cup of tea, and sit down and collect your thoughts. If you find it helpful to pray to a god (something you know nothing about), fine. But it is really healthier for the mind to leave behind all the characters that people over the centuries have invented or given powers to, for which there is little or no foundation. Because with those invented characters and powers – that's where division and hate join the little party in your mind. That's where, in your mind, you are inheriting the division and hate from ordinary politicians, lobbyists and salesmen from long ago. My goodness. I realize you're responding to that other fellow who posts here. But I can't help but feel you're being a bit presumptuous on... For one thing, even if they are all imaginary, why is it unhealthy to believe in imaginary friends and fairy tales? What are you basing your claims on? Why is your approach of the world superior? Because aren't all ideas about "reality" are in actuality, relative and subjective? I can't prove that any of this really exists outside of my head? So what makes you "right" about atheism being healthy? Can you define what you mean by "healthy?" Pray for those who persecute you and spitefully use you and love your neighbor as yourself doesn't sound all that subversive to me. I am not talking about how man has twisted God's Word and acted foolishly giving it a bad rap. Read what Christ said- don't look at the assinine actions of the so-called religions and the men behond it. Read the Bible without any relogious affiliation and make your own decisions. There are alot of blind-guides out there! Rudnim, you said "There are alot of blind-guides out there!" Who exactly do you think cobbled the bible together in the first place? It wasn't beamed down from the sky. I am sure you would find if false religion was not loosing it's numbers like they are, they would not resort to telling jokes and telling people what they want to hear instead of speaking the truth from God's Word. I don't recall reading in the Bible Jesus resorting to telling jokes to help them have a relationship with his Father. Jesus was a Jew and you think He didn't tell jokes? What planet are you from? Humor is the first thing to be lost in translation. The entirety of palm Sunday was a joke. Marcus Borg wrote an interesting book "The Last Week" In which he explains the joke, in the political context of the time. Bill.I was explaining that Jesus did not not jokes when explaining how we can have a relationship with his father. None recorded in the Bible. It maybe that at other times Jesus told a joke or two as humans do, but there is none recorded in the gospels that I know. Agree. Christ was a man of sorrows- Not a bafoon in a halloween style costume looking for a drum-roll after his comments. I wish I could have been there – sounds like it was a hoot. For you trolling hateful atheists – it's a Christian thing, you wouldn't understand. I am a Christian and I don't find his comments anything like a "hoot". Trolling Hateful Atheists... oh that's good. Perhaps you should put your bible down and read some of the other comment boards... you'd be unpleasantly surprised at who the real hateful people are, idiot. Yeah... lets all change our lives based on man made religion. yes.....and kill people who do not wish to partake in the same belief. Dolan, y u do dis?